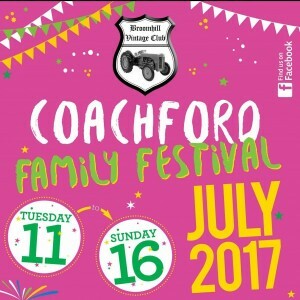 Coachford is about to come alive in July when the annual Family Festival takes place from July 11th to 16th. The Festival, now in its eight year, promises something for everyone and looking at this year’s programme that certainly seems to be the case. The festival will kick off with a night of Bingo in O’Riordan’s Bar on Tuesday July 11th, this is a great opportunity for those who may be new to the ‘Two little Ducks’ and ‘Legs Eleven’ calls to experience a bit of fun in a great atmosphere. Wednesday 12th brings Road Bowling back to the locality after an absence of twenty years and a massive Senior and Junior ‘Score’ will take place close to the village. The fourth Annual Road Race will see runners and walkers competing on Thursday July 13th. The 5 Mile race will start and finish in the village and a large crowd is expected to take part. Registration is from 6pm at the GAA Hall with the race starting at 8pm sharp. There is chip timing for the runners, cash prizes for the winners and refreshments for all. Children will be dressing up on Friday July 14th for the first ever Fancy Dress Parade through the village which will be followed by an open air Disco for national school children. On Saturday 15th High Nelly bicycles will be dusted off and oiled up for the annual run from Coachford to Dripsey via Peake. The bikes will leave the GAA grounds at 5pm and all are welcome to take part as long as you have one of those coveted High Nellies. Later in the evening, Man’s best friend will be paraded in all their glory as the annual Dog Show takes place at the GAA Grounds at 7pm. Pure Breeds, mongrels and mutts are all welcome and there are prizes to be won in a huge range of classes. On Sunday July 16th the committee have put together one of the busiest, full filled shows that could be possible. Starting from noon the day unfolds to bring you tractor building, children’s sports, model toy show, wife carrying competition, Coachford’s fittest family, egg tossing, bubble soccer, huge vintage rally, farmers market, tribute to Ford Ireland on their 100th Anniversary, Ireland’s highest mobile climbing wall, tea’s & cakes loads of trade stands, children’s fun fair, face painters, balloon modellers, and so much more. Two of the most popular events from last year, wife carrying and fittest family, are back again. Wife carrying is a hilarious and strange event where men use all sort of lifts to carry their or even someone else’s wife across a fairly flat course. All you need to take part is a wife and a husband, a helmet for the wife and a sense of fun for both. The fittest family needs four to take part, they don’t have to be related but it helps! The family of four compete against another family over an obstacle course in a timed race and the winners go on to the next round. Jerh O’Sullivan, Chairman of the Festival said, “This year’s event looks like it’s going to be our best ever festival. We are really looking forward to the celebration of Ford’s 100th Anniversary and we are inviting all Ford owners to come along to the show and especially those whose car was built in the Ford plant here in Cork. Our Five Mile Road Race is a really great event and is one of the best organised and stewarded in the county. The Broomhill Tractor Builders will be competing at the show on Sunday and both Women and men’s teams will be trying to do a record time. “Our Festival has donated almost €65,000 to various charities over the years and this year we are donating the proceeds to Marymount hospice, Pieta House, CUH Children’s unit and some local charities. While raising funds is important we also aim to provide fun for all those who come to Coachford to enjoy a summer festival for everyone.” Further information can be found on the festivals facebook page or by ringing 086 8329321.